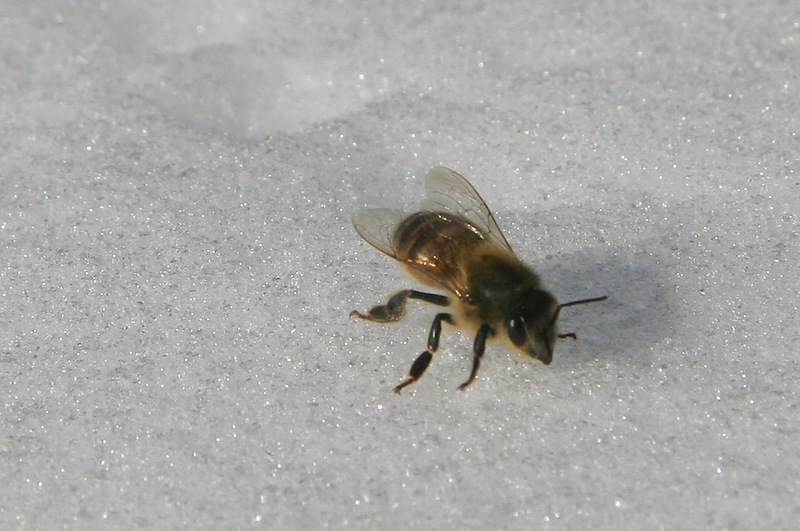 Unless you have a beehive in your backyard, you don’t see a lot of honeybees during Winter. 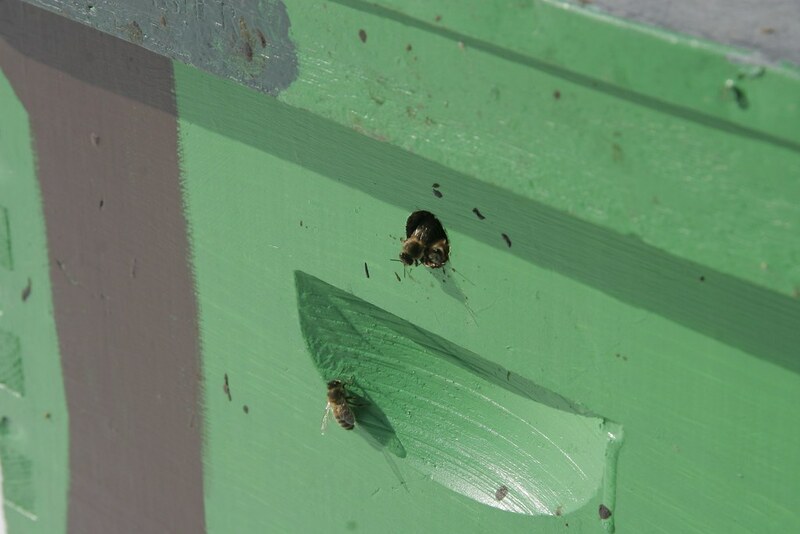 In order to survive the long cold between flower blooms, the whole colony balls up inside of the hive and conserves heat by rubbing against one another. This mass of bees starts at the bottom of the hive and moves up the center eating all the honey. If they built up enough of a stockpile and the beekeeper didn’t take it all in the Fall, there will be enough to last till the Spring bloom. We didn’t harvest any honey last Fall, in fact Robby added an extra box of honey for the weaker of the two colonies (note the white box). Another factor that helps the bees survival over the Winter is death. The population of the hive drops dramatically from 50,000+ at the peak, all the way down to a few thousand. This greatly reduces the rate at which the colony consumes the honey stores. 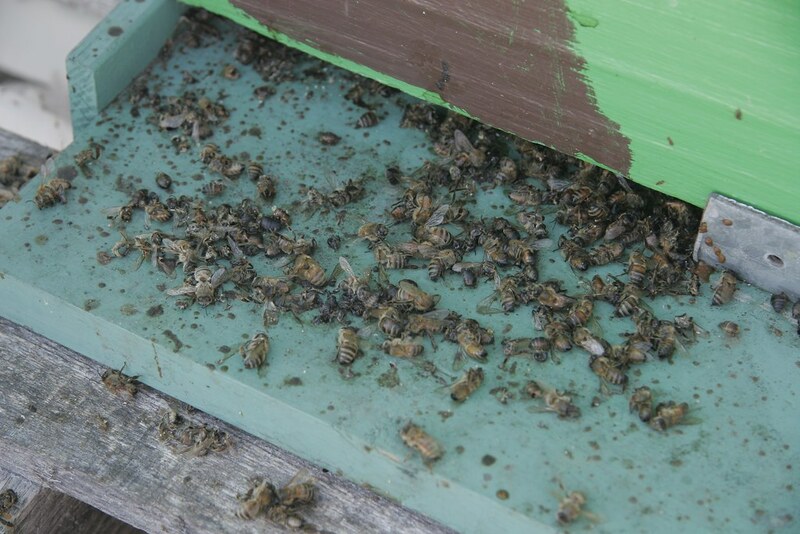 Of course, with fewer workers around general hive cleaning maintenance is neglected, and the bottom board becomes a mass open grave. The bodies pile up next to puddles of excrement almost blocking the hive entrance. 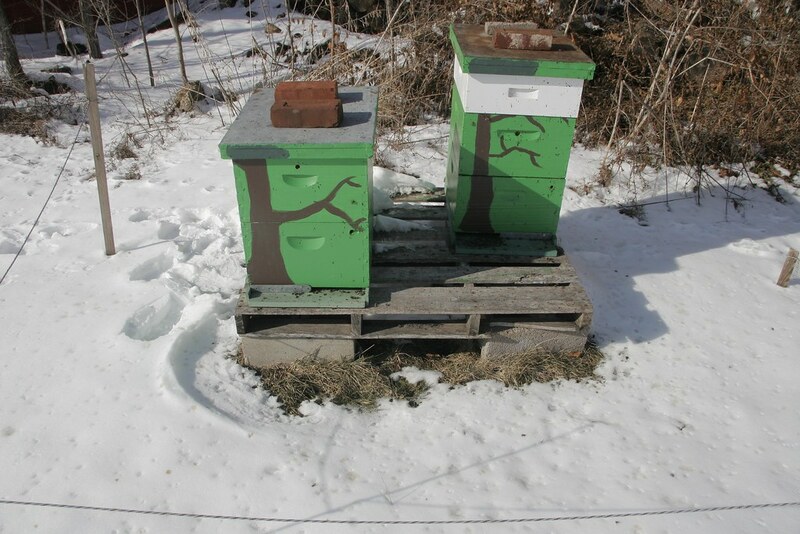 On nice sunny Winter days some activity can be viewed around the hives. These photos were taken when the temperature was hovering around freezing, but the sun was thawing some of the accumulated snow. Bees were peaking out of the hole in the hive. I sat and watched with my camera, eager to see where the bees were venturing out to, and for what purpose. The purpose of her flight quickly became obvious. 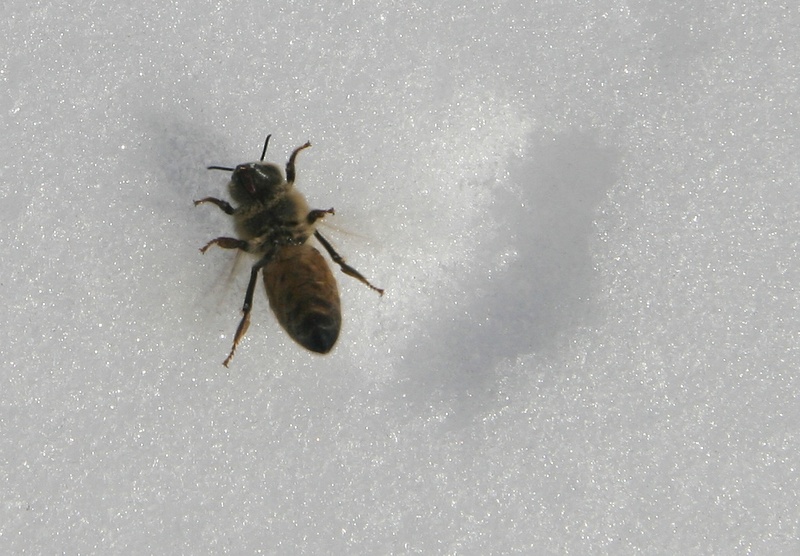 After scurrying around along the surface of the snow for a few minutes, this bee keeled over and died. Perhaps in a selfless act, she sacrificed herself so the rest of the colony could have enough to eat and survive. Or perhaps she was denied access to the honey stores and escaped only to find the cold white doom outside. A lot of what I’ve read about beekeeping suggests thinking about the entire colony as one living organism, and each bee, while performing a specific set of tasks, functions as the tissues and organs. So, like a bear who hibernates through Winter, the hive emerges in the Spring leaner, and eager to build up and stockpile of food. While thousands of dead bees littered around the hive seems grim, it is all part of the process of seasonal regeneration.